The Giralda is the most emblematic monument of Seville. This Minaret, 76m in height, originally was constructed by the Moors between 1184 and 1197. After the reconquest in 1568 the Christians fitted the minaret with the bell tower. 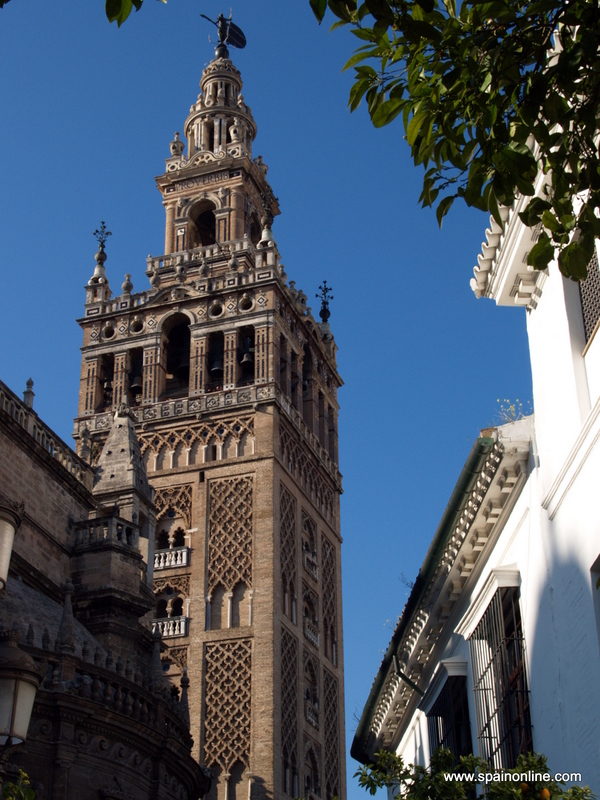 As an emblem of Seville the Giralda forms an elegant and tall silhouette next to the Cathedral. Built in the 12C, the minaret (96 m) of the former mosque was crowned with three golden orbs which disappeared in the 14C during an earthquake. Several designs were proposed to substitute them. The current appearance of a belfry was designed in the 16th century by the Cordovan architect Hernán Ruiz, who added the bell chamber and four upper rooms each with their own balconies. A statue symbolising faith stands at the top of the tower and acts as a weathervane, whose nickname Giraldillo also gives its name to the tower. The subtle, delicate decoration exemplifies perfectly the principles of the Almohad religious movement. It is rigorous, austere and against all forms of luxury. This was the origin of an artistic trend that linked beauty with simplicity. You can climb the 70m bell chamber up a 34 story ramp with a slope that decreases toward the top to facilitate easy climbing. Take your time and enjoy the views of the orange trees in the courtyard, the gargoyles, the pinnacles of the Cathedral and the Alcázar palace. Once there you will be rewarded for your hard efforts as the panoramic view over Seville is superb.